About 6 years’ ago, whilst on playground duty, I was approached by a year 11 (equivalent to a fifth former in ‘old money’) who wanted to talk to me about doing Politics A-level. I’ll call him James, and it is worth me telling you that he was regarded at the time as one of the most politically active and interested of his year group. It was in the run up to the London Mayoral election that would see Boris Johnson overhaul the normal a Labour ascendency in urban areas to beat Ken Livingstone. But James was concerned: Why”, he asked “would anyone vote for the BNP?”. I asked him why he thought that would be happening and he said “well, it looks like Boris is going to win isn’t it, and he’s basically the BNP.” After a few further questions I realised that having been brought up by left-wing parents and sent to a school powered by left-wing ideology, James had never bothered to understand why anyone might vote differently, so, powered by lazy ignorance and the simplicity of moral certainty, he assumed even the most centrist of Conservative voters must be racist scum. I thought of this boy whilst I was watching “UKIP, the first 100 days” on Channel 4 earlier this week. The programme imagined a situation where UKIP achieved 36% of the popular vote, and thus managed to gain a slim majority on May 7th. A genuine opportunity, then for a serious look at what that might mean in terms of policies, in terms of the way the party would translate what would be a popular mandate if in the hands of a mainstream party into a proper governing programme. An opportunity, perhaps, to see how the programme makers foresaw UKIP making the transition from populist vote-grubbing promises to the compromises of having to put food on everyone’s plate and run the NHS. Except that the programme had seemingly been written by a bunch year 11s (5th formers) like James and his mates. It took every possible stereotype it could, and lazily flung it at the plot. It was all there. Immediate leaving of EU without any negotiation nor discussion of referendum? Check. Beefed up border control agency full of ex-army meatheads going around beating up suspected illegal immigrants? Check. Anyone who isn’t white but who belongs to the party exposed as having been duped and eventually seeing the error of their ways? Check. Neil Hamilton, disgraced former MP who cannot even get selected to fight a seat as Deputy Prime Minister? Check. To tell the truth, I think a bunch of year 11s could have actually done better, as they might have thought at some point they should attempt some form of nuance to what was going on instead of purely banging out the left-wing fantasy/nightmare of what a UKIP government might be like. I say ‘fantasy’, because at their most laziest and morally superior, at those times when the left like to ban UKIP from political debates on grounds of ‘tolerance’ it is based on what they feel is a genuine belief that the country presented in “UKIP, the first 100 days” really is the country we would become if it happened. The desperation of the programme makers was made clear by the use of old footage of anti-racist and socialist worker campaigners speaking to the cameras about how they have to challenge UKIP as representatives of democracy when it was democracy that put them in 10 Downing Street in the first place. At its outset, the programme said that UKIP had 36% of the vote, Labour and Conservatives both below 25%. 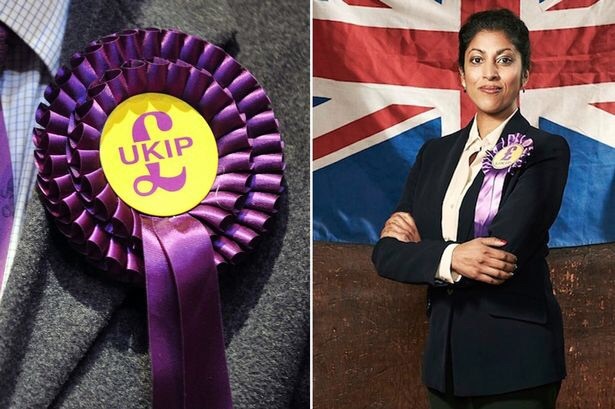 If the country really had got to the state where it had given UKIP that mandate then it would partly have been caused by programmes like this, people like this, telling people thinking of challenging the UK’s political culture, telling people for whom the mainstream parties have no answer, that they are wrong and racist. I’m not even going to get into the questions of the political impartiality that the broadcast media is supposed to have. I will I just say that the equivalent of this would be a programme called “Labour: The first 100 days”, that includes Len McCluskey standing in Ed Miliband’s office telling him what policies he can and can’t have, Labour politicians calling up businesses and telling them what to make, how to make it, and what to pay their staff, and the country struggling under 80% income tax rates and crawling to the IMF for a handout. Let’s see the reaction if that happens. It won’t though, will it?! This seems to have really got you going Paul – in places you are so carried away with indignation that your grammar and punctuation go to pieces (sorry – I am an English teacher). I didn’t see the programme in question – maybe I’ll watch it on catch-up – but I wonder whether you’re not taking it in the spirit in which it was intended. Perhaps there should be a serious and considered drama about UKIP – but the makers of this intended it to be outrageous and silly. I don’t know, I’m just speculating. I accept your point about a similar programme exaggerating the ‘dangers’ of a Labour victory being unlikely from the BBC or Channel 4 – but don’t worry – to make up for that lack 85% of the newspapers are attacking ‘Red Ed’ from every possible angle – and my guess is that when the time comes Miliband will get his fair share of bad press and confrontational interrogation from BBC interviewers. Last time out Gordon Brown got a hell of a roasting from Paxman (who now admits to being a ‘One Nation Tory’) and the BBC’s chief political correspondent Nick Robinson was in the young Conservatives at university. When we throw in Sky News with it’s obvious links to you know who – then I think we should keep things in proportion. Obviously I agree with you that lefties who want to prevent UKIP from taking part in debates are idiots. Having had the leader of the Green Party address our Sixth Form assembly we are also going to have candidates from Labour, UKIP, Lib Dems (Maajid Nawaz) and the Conservatives coming in over the next few weeks.